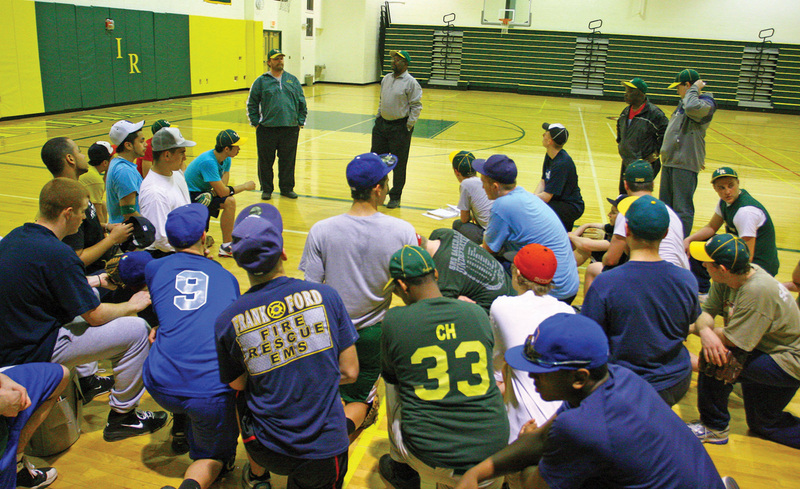 Former Indian River High School baseball coach Howard Smack leads the boys during an indoor practice in 2010. There are more than 200,000 cases of kidney disease each year in the United States, according to medical professionals. Many times, those affected can live their lives with treatments and a change in lifestyle. However, there are those that have situations more dire, and a kidney transplant is required for them to continue living their lives. Such was the case for former Indian River High School teacher and coach Howard Smack. “Mr. Smack” was a part of the IRHS staff for more than 39 years before his health forced him to retire short of his 40-year goal. But Smack recently found a match, after nearly eight years on the kidney transplant waiting list. He had successful transplant surgery just one month ago, on April 1, at Christiana Hospital. His road to transplant surgery started way back in 2008, when Smack started noticing some shortness of breath. Always one that was involved and active, Smack felt something was awry when he struggled to walk the stairs at the old high school. He had already been diagnosed with Type 2 diabetes, but this was something that he hadn’t experienced before. A visit to his doctor led to the idea that more tests should be done to see what was going on. Those tests revealed that Smack was suffering from kidney failure, and he would need to go on dialysis. He went on partial dialysis beginning in 2010, but two years later “another little episode,” as he calls it, forced him to go on full dialysis. When he started the full dialysis treatments back in 2012, he had signed up for the donor transplant list. Dialysis was an all-day affair, and he was reminded that the process to find a match could take four to five years. And, as it turned out for Smack, the waiting game actually took about six years to find his match. “I kept praying; my family and friends kept praying,” he recalled of the wait for a donor. With his surgery now complete, life can continue for Smack and his wife, Joan, and their blended family of six sons and a daughter. There is a whole new lifestyle that he lives every day, and he is certainly getting into a new daily routine. “I wake up every day at 8 a.m.,” he said. “I have to weigh myself, check my blood pressure, and check my blood sugar because I still have diabetes. I need to eat three to four meals a day, and I have pills that I need to take every day for the rest of my life. The most important is the rejection pill, to make sure that the kidney keeps working. The daily routine is becoming easier, for sure. And what about the person who was his match to receive their kidney? “I have no idea who they are,” he admitted. “I will venture into that soon. I do know that the person, unfortunately, died, and they harvested his or her organ for me. Because they were deceased, they had to work extra-hard to get it to go in with my body. Howard Smack was a man of many hats at Indian River. During his 39-plus years with the school district, he served as a teacher for history, social studies, economics and sociology. He also served as the school’s vocational coordinator and ran its Co-Op program. He was a 9th-grade guidance counselor. And certainly no one associated with the school could forget all the countless days and nights on the field or on the courts as a basketball, baseball, softball, track and football coach. “I pretty much was involved in anything I could do to help the students,” he said. “I loved every moment of my time at Indian River. I woke up every day glad to go to work. I enjoyed what I was doing helping young people and knowing that you were playing a role in their life.